Art curators will be able to recover images on daguerreotypes, the earliest form of photography that used silver plates, after a team of scientists led by Western University learned how to use light to see through degradation that has occurred over time. Research published today in Scientific Reports includes two images from the National Gallery of Canada's photography research unit that show photographs that were taken, perhaps as early as 1850, but were no longer visible because of tarnish and other damage. The retrieved images, one of a woman and the other of a man, were beyond recognition. "It's somewhat haunting because they are anonymous and yet it is striking at the same time," said Madalena Kozachuk, a Ph.D. student in Western's Department of Chemistry and lead author of the scientific paper. "The image is totally unexpected because you don't see it on the plate at all. It's hidden behind time," continues Kozachuk. "But then we see it and we can see such fine details: the eyes, the folds of the clothing, the detailed embroidered patterns of the table cloth." The identities of the woman and the man are not known. It's possible that the plates were produced in the United States, but they could be from Europe. For the past three years, Kozachuk and an interdisciplinary team of scientists have been exploring how to use synchrotron technology to learn more about chemical changes that damage daguerreotypes. Invented in 1839, daguerreotype images were created using a highly polished silver-coated copper plate that was sensitive to light when exposed to an iodine vapour. 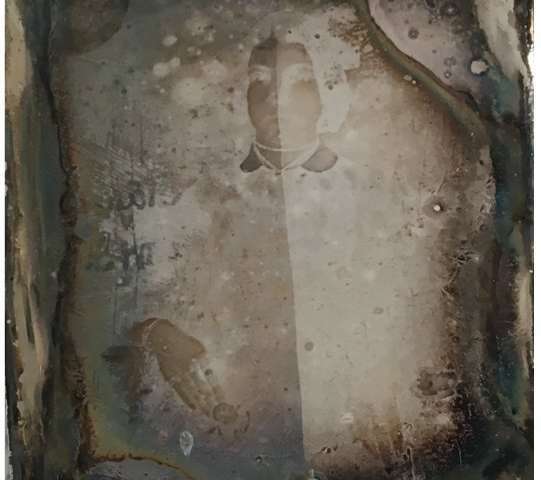 Subjects had to pose without moving for two to three minutes for the image to imprint on the plate, which was then developed as a photograph using a mercury vapour that was heated. Kozachuk conducts much of her research at the Canadian Light Source (CLS) and previously published results in scientific journals in 2017 and earlier this year. In those articles, the team members identified the chemical composition of the tarnish and how it changed from one point to another on a daguerreotype. "We compared degradation that looked like corrosion versus a cloudiness from the residue from products used during the rinsing of the photographs during production versus degradation from the cover glass. When you look at these degraded photographs, you don't see one type of degradation," said Ian Coulthard, a senior scientist at the CLS and one of Kozachuk's co-supervisors. He is also a co- author on the research papers. 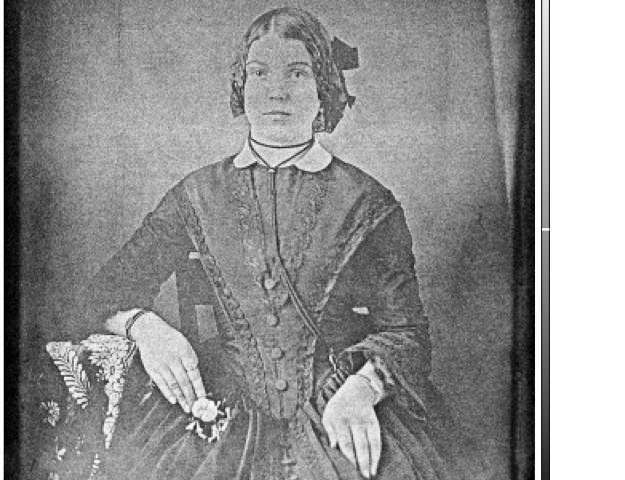 This preliminary research at the CLS led to today's paper and the images Kozachuk collected at the Cornell High Energy Synchrotron Source where she was able to analyze the daguerreotypes in their entirety. Kozachuk used rapid-scanning micro-X-ray fluorescence imaging to analyze the plates, which are about 7.5 cm wide, and identified where mercury was distributed on the plates. 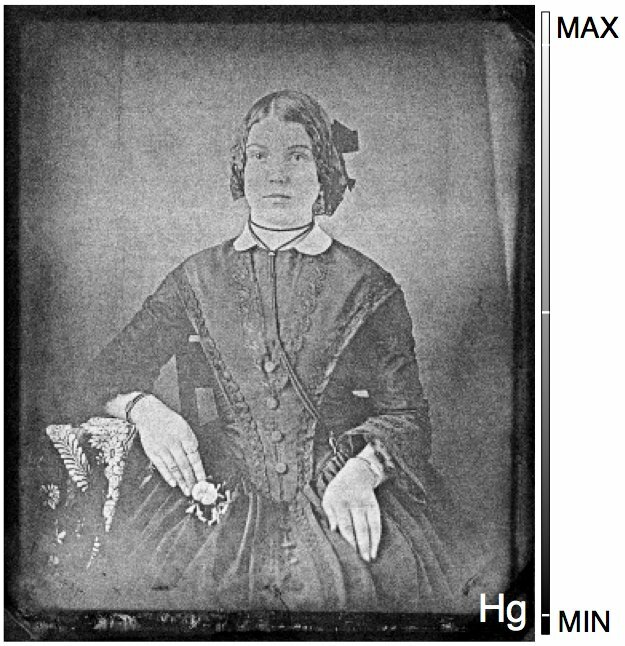 With an X-ray beam as small as 10x10 microns (a human scalp hair averages 75 microns across) and at an energy most sensitive to mercury absorption, the scan of each daguerreotype took about eight hours. "Mercury is the major element that contributes to the imagery captured in these photographs. Even though the surface is tarnished, those image particles remain intact. By looking at the mercury, we can retrieve the image in great detail," said Tsun-Kong (T.K.) Sham, Canada Research Chair in Materials and Synchrotron Radiation at Western University. He also is a co-author of the research and Kozachuk's supervisor. 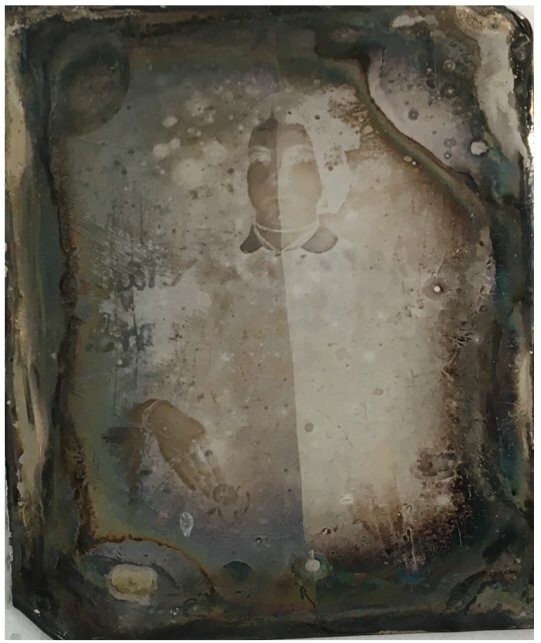 This research will contribute to improving how daguerreotype images are recovered when cleaning is possible and will provide a way to seeing what's below the tarnish if cleaning is not possible. The prospect of improved conservation methods intrigues John P. McElhone, recently retired as the chief of Conservation and Technical Research branch at the Canadian Photography Institute of National Gallery of Canada. He provided the daguerreotypes from the Institute's research collection. "There are a lot of interesting questions that at this stage of our knowledge can only be answered by a sophisticated scientific approach," said McElhone, another of the co-authors of today's paper. "A conservator's first step is to have a full and complete understanding of what the material is and how it is assembled on a microscopic and even nanoscale level. We want to find out how the chemicals are arranged on the surface and that understanding gives us access to theories about how degradation happens and how that degradation can possibly or possibly not be reversed." As the first commercialized photographic process, the daguerreotype is thought to be the first "true" visual representation of history. Unlike painters who could use "poetic licence" in their work, the daguerreotype reflected precisely what was photographed. Thousands and perhaps millions of daguerreotypes were created over 20 years in the 19th century before the process was replaced. The Canadian Photography Institute collection numbers more than 2,700, not including the daguerreotypes in the institute's research collection. By improving the process of restoring these centuries-old images, the scientists are contributing to the historical record. What was thought to be lost that showed the life and times of people from the 19th century can now be found.